London: Printed for J. Davies, T. Smith, N. Taylor, and W. Thomson Two volumes bound as one. 134, , 124pp. Contemporary half-calf, marbled boards, contrasting red morocco lettering-piece, gilt. Extremities rubbed. Recent endpapers, later ink ownership inscription to front blank fly-leaf, occasional spotting, slight marginal chipping. A late eighteenth-century edition of Anglo-Irish author Oliver Goldsmith's (1730-1774) most renowned work; printed in an unusual typeface almost certainly suggesting continental publication - indeed ESTC records the imprint as being false. 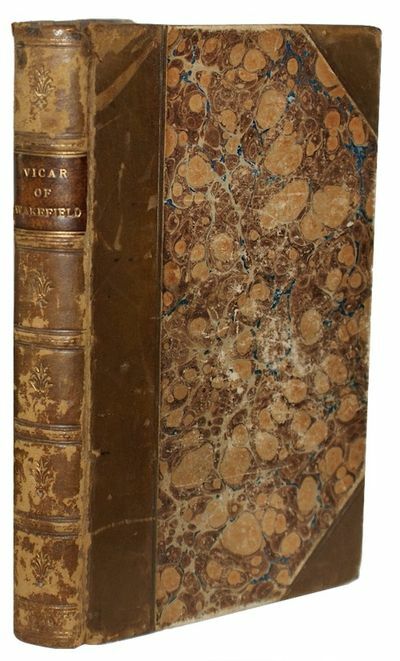 First printed in 1766, The Vicar of Wakefield would become one of the defining novels of the eighteenth-century; sadly the author was to profit little from the sensational success of the work, as Samuel Johnson had sold the rights for Â£60 in order to relieve Goldsmith from the pursuit of debtors. ESTC locates copies of this edition at only a single location in the British Isles (NLI), and a further six locations in North America (Columbia, McMaster, Philadelphia, Toronto, Wisconsin-Madison, and Yale). ESTC N45806.. 1789. 12mo.